Sing to Life: Biscuits. There is no more to say. I don't mean to tread on any toes here, but Better Homes and Gardens is not really my thing. As a spry young newlywed, I got a great deal on a three-year subscription and figured - how could I not love a magazine that will inspire me! Homes? Gardens? That's totally my thing, man! Sign me the heck up! Well, gotta say - that magazine is not my thing. I mean, it should be my thing, you'd think, but every issue is like walking through a neighborhood that is hands-down better than yours. The women have better hobbies. They make better use of their time than you do and therefore have all these neat crafts decorating their tables. They host way better parties and they have much better decorating savvy than you. Their gardens look waaaaaaay better than anything you'll ever do in your yard. I mean, think about it! The name of the magazine says it all! It might as well be titled, Woman, Thou Art Inferior to These Other Women. So I always put down every issue feeling guilty. I should be better, I think, so I, too, can have a better home and garden. Ugh. Yuck. I hate feeling guilty. I deal with enough guilt, both deserved and unfounded. I don't need a three-year guilt subscription on top of that. And to top it off, their recipes are weird! They're always trying to combine sweet things with savory food and it never looks appealing to me. Cinnamon Roasted Chicken with Pumpkin Sage Grits? Strawberry-Jalapeno Barbecue Ribs? Bread Pudding Quiche with Berries and Bacon? If any of those sound good to you, go right ahead and cook 'em. But I almost never tear a recipe out of that magazine. Except this one. 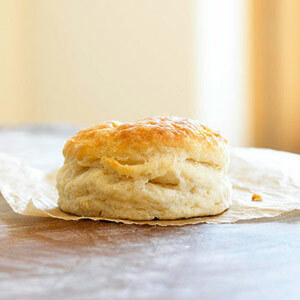 Classic Buttermilk Biscuits, baby. When all's said and done, if this recipe is the only thing I ever get out of my three-year Better Homes and Gardens magazine subscription, it will be worth it. I modified the recipe method just slightly, and also tried freezing the biscuits for later. It worked! Thus, I will share it with you, my wonderful readers. I'm going to use a food processor for this. It makes the job faster and easier, but you can mix by hand if you like. I'll allow it. Now grab 1/2 cup plus 2 tablespoons COLD butter. Frozen or nearly so is okay. Cut it into rough cubes. Take roughly half the butter and throw it into the food processor. Process the crap out of it! You want that butter to be decimated. TINY. And, using short, choppy pulses, cut the butter into the flour until it's in pea-size pieces. These larger chunks will make the dough flaky, while the tiny pieces make it moist. Grab two cups of buttermilk. If you don't have buttermilk, pour three or four tablespoons of white vinegar into your measuring cup and fill the rest up with milk. Let sit for a few minutes and you'll have a perfectly fine substitute for buttermilk. That's what I almost ALWAYS use. Dump it into the flour mixture and use short pulses until the dough comes together, as shown below. See how sticky it is? If it's dry, add a few more tablespoons. Below, I've squished it into a cohesive mound so that it will be easier to roll it out. To the right, you'll see that I've heavily floured a board to roll it. Now, you'll notice a lack of a few pictures. My hands were verrrrry sticky, so I just didn't want to ruin the camera. But basically, dump out the dough onto a well-floured board. Flip it over a time or two to get flour on all sides. Use a rolling pin - and extra flour if you need it - to roll the dough out about 3/4" thick. Now you'll need a biscuit cutter. I don't have one, so I'm using a clean, empty tin can from something I cooked recently. A biscuit cutter would really be better. Sharper sides, you know, so the dough doesn't get squished too badly. But, oh, this worked just fine. Now, cut away! Cut the biscuits as closely together as you can. Put them onto a cooking sheet. Any extra dough that you have left over, roll it together again and cut out more biscuits. Try not to do this too many times, because the dough gets tougher the more you work with it. It's okay if they don't look perfect. Anyway, if you want to bake them now, go ahead! The recipe calls for 8-12 minutes at 500 F. BUT if you want to freeze them for convenient use later, just pop them - like this - into the freezer. When they're completely frozen solid, which'll take a few hours or so, use a spatula to pop them off the sheet into a Ziploc. When you want to cook them, take them straight out of the freezer and bake at 500 F. You'll probably have to cook them a little longer than 8-12 minutes, so just keep an eye on them. When they come out of the oven, brush with melted butter and serve hot. These are so, so good. Flaky and buttery-rich. Not crumbly, but not dense, either - they're perfect. By the way, I forgot to photograph my finished (baked) product. But honestly, they looked like the picture. So if you, too, want picture-perfect biscuits, glean from my guilt-trip through Better Homes and Gardens. 1. Heat oven to 500°F. In large bowl combine flour, baking powder, and salt. Using your fingertips or a food processor, work the butter into the flour until half is well-blended and the other half remains in large, pea-sized pieces. With a food processor, you will want to make this two separate steps. 2. Make a well in center of flour mixture. Add buttermilk all at once. If mixing by hand, use a large spoon to stir mixture quickly, just until it is blended and begins to mass and form a sticky dough. (If dough appears dry, add 1 to 2 tablespoons additional buttermilk.) If using a food processor, pulse until just together. Don't over-pulse. 3. Immediately turn dough onto generously floured surface. Using floured hands, work the dough until a cohesive ball of dough forms. Gently flatten dough with hands to even thickness. Using floured rolling pin, lightly roll dough to a 3/4-inch thickness. 4. Using a dinner fork dipped in flour, pierce dough completely through at 1/2-inch intervals. Flour a 2 1/2- or 3-inch biscuit cutter. Stamp out rounds and arrange on heavy baking sheet. Add dough pieces, as-is, to baking sheet. 5. Place on rack in upper third of oven. Bake 8 to 12 minutes until crusty and golden brown. Remove. Brush with melted butter. Serve hot.